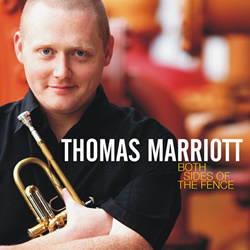 If Seattle, Washington-based Origin Records can be said to have a signature sound, trumpeter Thomas Marriott's Flexicon could be picked as an example. 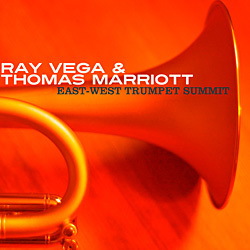 The music is mainstream, with two horns and a rhythm section, polished up and modernized with a nice edge, some luminous Fender Rhodes, a solid-yet-adventurous bassist, and a top notch, push-the-tradition-forward drummer. And everything small and large that the drummer does can be heard. Additionally, Joe Locke is featured on vibes on a couple of tunes. Marriott's excellent Crazy: The Music of Willie Nelson (Origin Records, 2008), expanded the boundaries of the trumpeter's musical world on a quirky and offbeat offering. The equally fine Flexicon reigns things back toward more standard, straight-ahead fare, with a cast of Northwest/Origin Records All-Stars. 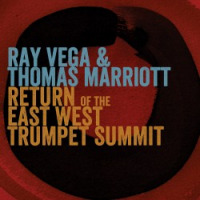 The set blasts off with Freddie Hubbard's "Take it to the Ozone" on some high octane unison horn blowing and a pedal-to-the-metal ensemble work. 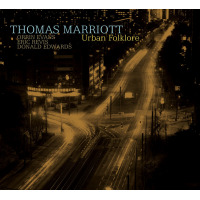 Marriott's first solo suggests he should be mentioned in the same breath with Wynton Marsalis and Terence Blanchard in terms of purity of tone and control of his instrument. He gives way to Locke, who adds a buoyant luminescence to any situation he joins. Wayne Shorter's "Masquelero" recalls Miles Davis' second great quintet workmysterious, dangerous, and full of dark shadows. Saxophonist Mark Taylor, on soprano here, playing entrancing lines in front of drummer Matt Jorgenson's waves-on-the-beach percussion. Pianist Bill Anschell, on Fender Rhodes, goes searching the night time streets on his solo. 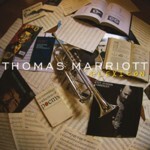 Rodgers and Hart's "Spring is Here" lightens the mood, with Marriott and company giving the tune a zingy, modern treatment. "Little Frances," from Marriott's pen, sounds like a '60s jazz standard. 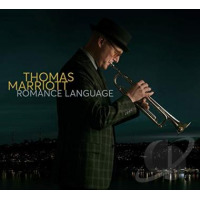 The tune showcases Marriott's clean, hundred-karat tone that leads into an exploratory Jeff Johnson bass solo. The familiar "Detour Ahead" finds Marriott with mute, on this a sweetly introspective ballad that features a delicately pretty Anschell solo. Elvis Costello's "Almost Blue" closes the show on a beautifully melancholic note. 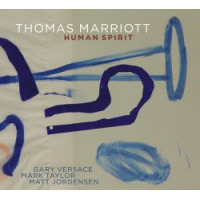 In a lonely duet with pianist Anschell, Marriott's horn talks, telling a sad tale in a rich, warm voice. A perfect ending to a first-rate jazz set. 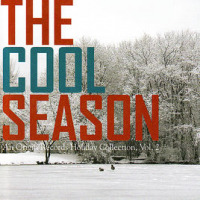 Track Listing: Take It to the Ozone; Masqualero; Spring is Here; Little Frances; Detour Ahead; Brothers and Sisters; You Only Live Twice; Circadian Rhythms; Almost Blue. 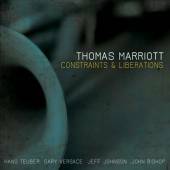 Personnel: Thomas Marriott: trumpet and flugelhorn; Mark Taylor: saxophones (1, 2, 4, 6, 8); Bill Anschell: piano and Fender Rhodes; Jeff Johnson: bass; Matt Jorgensen: drums; Joe Locke: vibes (1, 7).